Suitable for underwater areas of vessels or structures. Good performance. 18-24 months expected life. 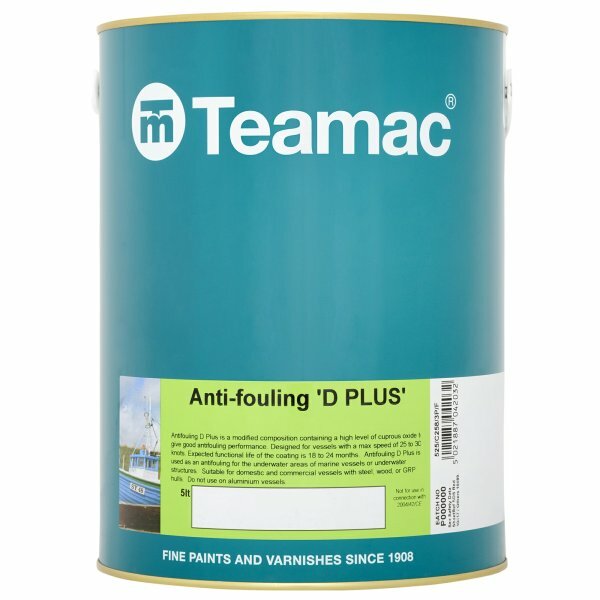 Teamac Antifouling D Plus is for the underwater area of vessels. Suitable for use with steel, wood, or GRP hulls on both domestic and commercial vessels. Also ideal for underwater structures. It contains a high level of cuprous oxide which promotes good performance. Expected life is between 18-24 months. For vessels with maximum speeds of 25-30 knots. Application is by brush or roller with coverage of up to 10sq/m per litre. Please note: This product is sprayable, but is not permitted except for professional use. The minimum recoat time is 16 hours, dependant of film thickness. Teamac Antifouling D Plus Blue is available in 1 colours from the Teamac Colour Cards.